This walk: 2011-3-23. Steps Bridge, Dunsford Reserve, Teign Valley Woods, Devon Wildlife Trust, weir, leat valves, coracles, river-side paths, wild daffodils, wood anemones, oak tree, dog's mercury, hazel catkins, lesser periwinkle. Steps Bridge over the River Teign: the entrance to the walk is just over the bridge and on the left-hand side. Click the photo to see a larger version. Dunsford Reserve is part of the Teign Valley Woods and is a good example of upland oak and hazel, typical of the south-west. It has some rare species including Sorbus torminalis - Wild Service Tree -is there a tame one? This is an ancient woodland indicator. The woods are a prime area for otters, pied flycatchers, redstarts, dippers and kingfishers. Managed by Devon Wildlife Trust since 1965. Now on a 50-year lease from the National Trust that commenced in 1986. Double leat valves by the weir across the river - more photos at the end of the walk. Showing water diverted by the weir (nearest camera), the River Teign (behind) and Steps Bridge. The frames of two coracles. A pleasant scene by the river bank, one of many such scenes. Looking back towards the bridge, with a hint of mist? The wood comprises sessile oak, a relic of abandoned coppicing activities. There are rocky outcrops and woody glades, all managed to prevent excess scrub. Everywhere we looked, the woods were carpeted with wild daffodils. 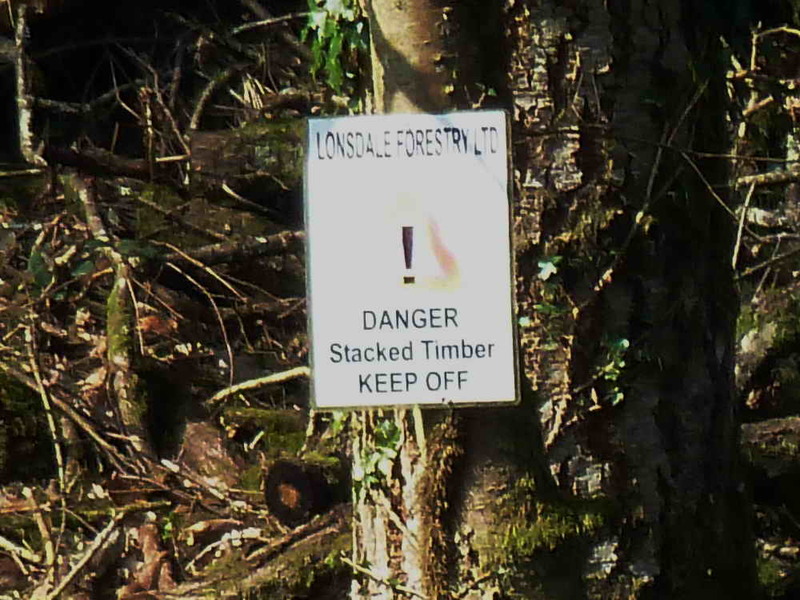 From Devon Wildlife Trust's Discover Dunsford leaflet: "Skyscraper of life! The huge oak tree is home to around 400 different types of wildlife from insects and the birds that eat them, to the mosses and ferns that cover its branches. It's probably around 300 years old". ..... and one in close-up. One of several benches along the riverside walk. 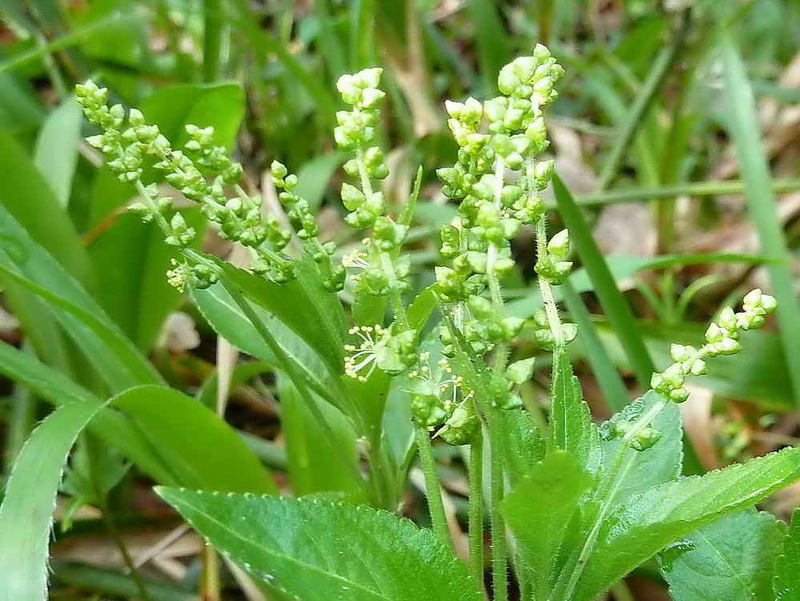 Mercurialis perennis, dog's mercury - highly poisonous and once once used by poachers to poison fish such as salmon. Looking down on the leaves. Coppiced oak or hazel? The site was famous for coppiced oak - must go back and look at the leaves and twigs once the leaves are out!. A large clearing of wild daffodils. A passer-by said that the flowers generally come out in patches here and there over quite a long season but that this year they were held back by the very cold weather and that they are now all flowering at the same time. "A bit of green" - for them as likes green! Looking up the valley side. Another large expanse of wild daffodils. Getting down to ground level, Jim! Sign seen along the way. Another view up-river, the weir is seen at the right side ..... the weir diverted water into a leat that ran to old mills that can be seen on the map below. Looking across the river from the road, showing the long weir that runs up and across the river. Lesser periwinkle, Vinca minor, and not lungwort as originally captioned, because the flower is not the trumpet shape of lungwort and the leaves are not spotted. It is lesser periwinkle because the leaves are smooth-edged and not hairy - this is seen better in the original high resolution images. 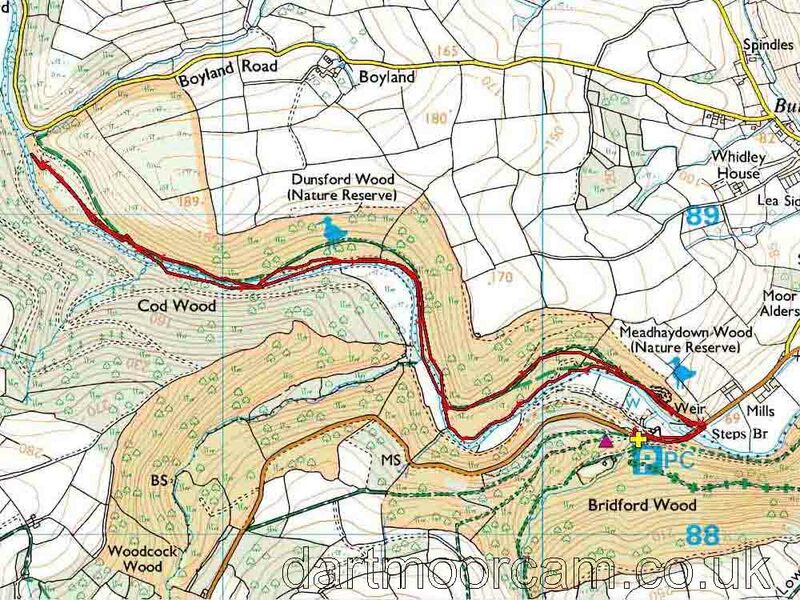 Apr�s Stroll - The Royal Oak, Dunsford. Good welcome, generous helpings, highly recommended. Steps Bridge car park is on the Moretonhampstead-Exeter road, the B3212, approximately 5 km from Moretonhampstead, at SX 803 883, marked by the yellow cross at the P symbol on the map.